I haven’t traveled abroad in years, but I have friends and co-workers who have. One comment I often hear is how different it is in other countries, from food to personal appearance to expectations for housing and entertainment. I find that old letters are the same. They bring to life a different time and place, a culture that is so very different than we experience today. Reading through an old letter is like traveling abroad, experiencing culture shock and also realizing how much the same things are. “Congratulations” on your new arrival. I was so happy when I got your Mom’s card that it was a little girl. That makes three baby girls in less than two weeks. Maybe times are changing this year for girls. I hope so. Everytime a baby boy is born I think how his life might be for Uncle Sam. A young boy today doesn’t know or really can’t plan on his future unless he is a farmers boy. It seems according to our daily paper that our county is going to be hit the hardest in the state for drafting young men in the next two months. It makes me have the chills. Well, S__, where is D__ and what is his work? Do you plan on going with him or what are your plans soon as the baby is old enough. I surely would love to have gone to J__’s wedding, then I could have seen you and the baby too. But I just couldn’t afford it for only a couple of days. You see we don’t get our vacation pay until we really want our two weeks vacation, and I haven’t put in for mine yet. Then on second thought I realized your Aunt E__ would have her hands full getting J__ ready today and all the excitement I figured if I was there too that would mean extra work for her. Do you sew very much? I bet now you will make the baby cute little dresses. Well, I will close for now and I want to tell you again how happy I am to hear you had a little girl. Love to you & baby. To put this letter into context, the Korean War was going on at the time and the draft was greatly feared. There were some ways to avoid the draft, such as being a farmer, married with children, or in school, although that was not guaranteed. My father was drafted when he was still in school and I’d already been born. The military base had a personnel shortage and did not care if he had a valid deferment. He did not go to Korea however. This is most likely what my aunt is referring to here. My mother sewed – many women did in those days. I don’t know that she made dresses for me, but she sewed clothes for herself and curtains for the house. I learned to sew on her Kenmore sewing machine and used it for a long time before getting my own sewing machine. My great aunt worked on a production line some distance from where she lived. She was very good at what she did, but the work environment was very strict. She generally took her two weeks of vacation to cook for the men when it was time for harvest. My grandmother took her two weeks of vacation at the same time to help out. Some things were different such as the fear of being drafted or having been drafted and not knowing where you’ll be going. Other things though remain the same, such as the affection for family and the balancing of our jobs and personal life. My sister and I wrote letters to each other for years. I’ve kept many of them and enjoy reading the time capsule of what we were doing at the moment. Facebook and E-mail does the same, albeit in real time. I see how my cousin visited her children and how my other cousin’s son complained when his Mom made him the designated driver one weekend. I was happy when a long-time friend posted pictures of his second grandchild. It’s important to share in each other’s life and leave a trail for the future generations to know who we are and what was important to us. Although our priorities constantly change, in the end this is the only way the next generations will know who we were. 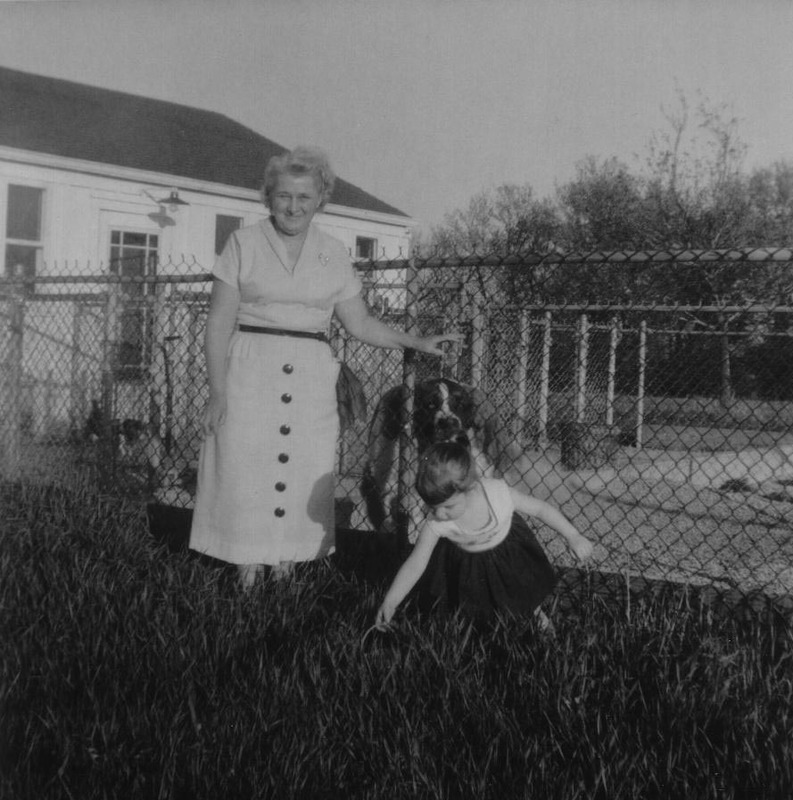 Here I am with my maternal grandmother. Word for tomorrow – SECURITY. If you prefer to work ahead, see the list for the week under “A Word A Day”. Good post. I love genealogy and hearing about the old times. And old letters are absolutely gold. I wish I had more. My grandmother did write a short autobiography that I cherish. My dad was drafted into the army and served in Germany during the Korean war. Lucky for him. I have one of my grandfather’s journals.� I think it’s ideas for inventions and not any significant thoughts, but I’ve never gotten it translated.� I wish I had more old letters too.� They’re not very deep, but they so remind me of long departed relatives.� How fortunate for you to have a memoir written by your grandmother – that is great! I have a whole shoebox full of letters to read from my father in law to his family during the war. Recently, I found a letter that had been hidden behind a picture of my uncle from during the war as well. (Been sorting through all the old memorabilia lately) They are indeed time capsules that deliver us to a different era in our family’s history, and our nation’s as well. You’re so right about letters as a peek into another time and place. That’s why I favor biographies. They’re like a history and sociology lesson all rolled up into one book. I’ve kept greeting cards given me by my husband and my daughter. I’ll always cherish the sentiments expressed within…snippets of their love for me. I do the same with voice mail messages left by my daughter. After a while I delete them. But until then, I can listen to her voice and feel her presence…though she’s 3,000 miles away.